Apple comes up with new features and facilities with very product version it launches every year. With Apple Watch, also came WatchOS 4 and a lot of health-related features such as a new heart rate metrics. One of them is Heart Rate Variability shortly known as HRV. Curious what HRV is and why should it be measured? Let’s get to know all about it in this blog! A healthy beating heart may also have healthy deformities. Even if you have normal BPM (60 beats per minute) it doesn’t prove that your heart beats once every second. Rather, there is variation among the intervals between your heartbeats. HRV (Heart Rate Variability) is the physiological phenomenon of variation in the time interval between heartbeats. It is measured by the variation in the beat-to-beat interval. HRV aims to provide whole information about your nervous system. Let us know how to measure HRV on Apple Watch. Before beginning the process, you need to stay steady for a hot minute. Either sit straight or lie down steady. 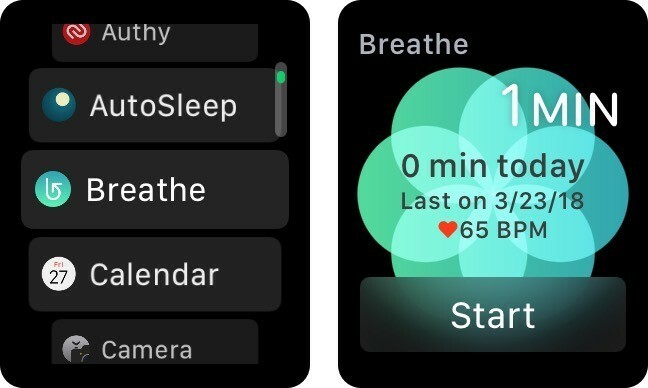 Launch Breathe App on your Apple Watch. Follow the onscreen instructions of Breathe app. Locate Health App on iPhone. Now Tap on Heart tab under Health Data. Select Heart Rate Variability to view the results. Also Read: How To Use Wi-Fi Calling On Apple Watch? Apple records HRV averages in iPhone Health app via Apple Watch readings. To do that Apple uses the standard deviation of NN intervals (SDNN). The first thing that happens when you put your Apple watch first time for a day, it will trip an HRV morning reading. The watch will track your heartbeat progressively for a minute, then calculates to come up with your HRV average. The result comes up on Health app on your iPhone. You can only get an idea of HRV patterns with Apple watch but won’t get details about the same. The accuracy of the HRV reading depends on various factors. Even if you move your wrist or your arm a little, it could affect the readings. Even if you are steady, there are other factors such as skin contact, emitter spectrum, skin thickness/color, and sensor positioning. However, Apple is constantly working on improving and extending the parameters. Hopefully, soon Health app will get updates and more features will be added to it and the Watch. Why Tracking Your Nervous System’s Health Is Important? HRV metrics tracks our autonomic nervous system(ANS). ANS helps your brain and its control centers to send signals to vital parts such as muscles, heart, and glands. It controls your digestion, heart functions, stress, and more. ANS has two subsystems working: Sympathetic & Parasympathetic. The sympathetic controls your “fight or flight” stress impulses and the parasympathetic controls your energy and aids your body replenish during rest periods. In the stressful world that we live in, we surely need to monitor the stress rate of our body. A high HRV average depicts that the parasympathetic of ANS is working just fine. If we don’t take care of our body and don’t take rest and take too much of stress, our sympathetic system has to push harder, which will give lower HRV readings. With HRV average readings, you can keep a check whether both sympathetic and parasynthetic part of the nervous system is in equilibrium. So, to keep your body stress free and take care of both sympathetic and parasynthetic part of the nervous system is very important. Hence, measuring Heart Rate Variability can help you with that. Do share your thoughts and opinions in the comments section below!